Protect your family and protect your investment. Have your home tested for radon today! 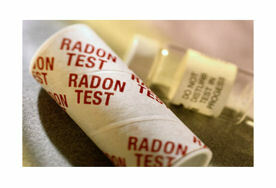 $120.00 for an EPA approved Radon Test with “express service” included. 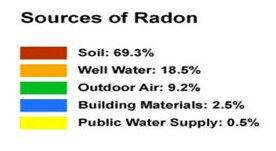 We may be subjected to Radon Gas from several different venues however; the most prevalent source is through the soil. It is not uncommon for a house to have very high levels of Radon Gas in the Basement and Foundation areas but little or no detectable Radon in the rooms above such a Basement. This is why testing is generally done in the lowest living areas of a house. Houses situated completely above grade are less likely to present with a Radon issue however; the only way to know is to test. The good news about Radon is that if it is found in a home it generally can be mitigated by taking several fairly inexpensive measures. The EPA has a web site (www.epa.gov/radon/index.html) that outlines these measures as well as providing you additional information. The typical method of removing Radon from an average home is approximately $800 to $1200 Hundred dollars and involves such things as sealing foundation cracks and having a sub-slab venting system professionally installed. Radon Gas seeps out of Uranium minerals located in the earth once Radon Gas has formed it seeks to rise out of the ground and into the air. It will travel in the path of least resistance. A void in the earth such as a basement is an easy area for the gas to flow into, especially if that basement is not sealed, or has porous qualities in its foundation. 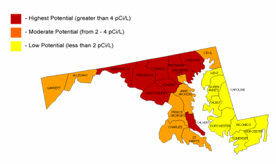 Radon can be found in many areas of Maryland. Radon has been known to not be present in some homes of a neighborhood and be prevalent in other homes. Radon levels can change in varying weather conditions. 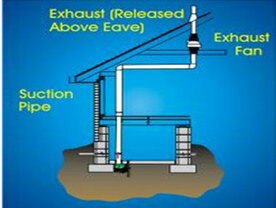 Snow & Ice cover can encourage the radon gas to enter basements and raise levels there. 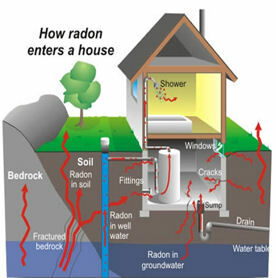 The only way to know if a house is subjected to radon is to have it tested periodically. In 1520 systematic botanist Paracelsus observed that a wasting disease of miners was occurring and surmised that it was coming from un-seen gases being emitted from the earth. Since that time other scientists have identified the gas, named it and confirmed that it is a health concern. U.S. based studies in the early 1970’s confirmed that Radon gas was entering some homes and causing instances of Lung Cancer in humans. Since then studies have proven that Radon poses significant health hazards and the EPA has estimated that “radon is the second leading cause of lung cancer behind cigarette smoking and that Radon is responsible for about 21,000 lung cancer deaths every year”.